+ Glühwein on the house, special recipe! Last year a dynamic love-affair developed between the Brussels based exhibition space SECONDroom and the Rotterdam based artist-run space Het Wilde Weten. During the exchange the plan was to flirt, to bring out many toasts and to secretly approach each other. How one thing leads to another………. Last year a range of Het Wilde Weten artists were hosted at SECONDroom. This week Het Wilde Weten will host the Brussels based artists Jan Verbruggen, Francis Denys and Korneel Devillé in their projectspace. SECONDroom has started on initiative of Christophe Floré, a project in collaboration with Mira Sanders and Jan(us) Boudewijns since 2006 the project has been realized bij numorous artists. 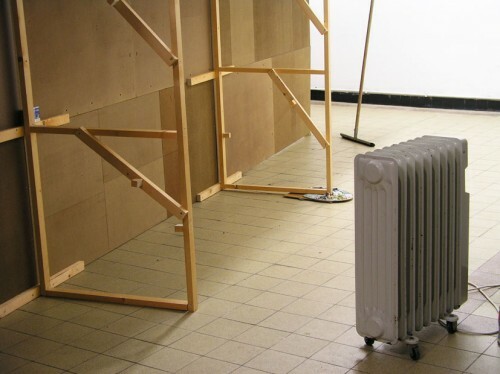 Since 2009 SECONDroom has been hosted by RECYCLART at Brussels. From 2010 onwards SECONDroom will extend to Antwerp with an exhibition space and will evolve to a multi-layered exhibition-initiative and explore the public sphere under the name moorDONCES, by Jan Verbruggen, Francis Denys and Korneel Devillé.